Barel Karsan - Value Investing: It's Not A Job Shortage, It's A Worker Shortage! Over the last several months, the US jobs report has indicated that private (i.e. non-government) hiring has turned positive, but remains at a low rate. Private payrolls increased by only 83,000 last month, which is rather insignificant in comparison to the fifteen million people classified as unemployed. However, what these headline numbers fail to expose is that a number of US corporations wish to hire, but cannot find workers with the sufficient skills. 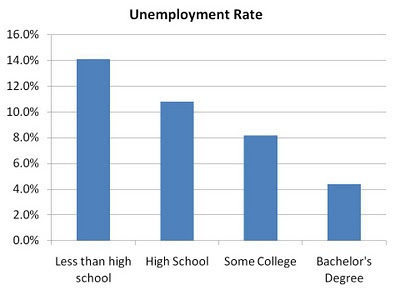 Note that the overall unemployment rate in 2007, when the American economy was booming, was 4.6%, which is higher than the current unemployment rate of 4.4% for those with Bachelor's degrees. This data suggests (although it does not prove) that there is a shortage of educated workers in the US. I say the data does not prove a shortage because some may argue that the educated workers are just better equipped to take the limited jobs that are out there, and so there is no shortage at all. That conclusion is not borne out by the data, however. If the educated were simply taking jobs away from the uneducated, one would not expect to see the gap between the salaries of the educated and the uneducated continue to grow - but it has. Moreover, the average salary offered to current university graduates is around $48,000/year, which is well above median salary of the average worker with many years of experience. These companies are able to make products/services that the world desires, even during a recession. Because they are at the cutting-edge of their fields, they are able to provide value to their customers while at the same time generating hefty profit margins and investment returns. To continue to innovate and drive these returns, these and the plethora of other companies looking to grow to this size need educated workers, and they are willing to pay for them, as evidenced by their higher salaries and lower unemployment rates. To improve America's prosperity, the emphasis should be on increasing its number of educated workers, as there is a shortage. On the other hand, there is an oversupply of uneducated workers, not only in America but around the world. As a result, developing countries will continue to steal market share in the production of the lowest-priced goods. America's advantage is in its ability to innovate and contribute to the creation of the world's highest-priced goods, however, from PC chips to OS software to smartphone designs to web software to jet technology to medical/pharmaceutical research. To continue to supply the world with the most advanced products in the world, America's companies are starved for workers with the ability to contribute. Measures that increase the number of educated workers are needed immediately, and can help shield the country from future economic hardship. The problem is a good deal more complicated than you make it seem. I would argue that there are far too many people with useless college degrees: the openings available are in areas that Americans are not studying in college, while there are a lot of college grads in other areas who are unemployed. I also question the "average" number of $48,000 for these workers. An average is meaningless when you could be averaging the salaries of people with degrees in nuclear engineering (and a masters' degree tacked on) with those who just majored in elementary ed and will start out on a first-year teacher's salary. That is to say nothing of the ridiculous creep of requiring a college degree to answer the phone at a call center. Yes, there is a shortage of workers with the qualifications that the few remaining jobs in this country require. But surely you recognize that, the further up the education chain one goes, the more one has invested and the LESS flexible one's education is with regard to areas in which one can work. There is a trade off. A successful, growing economy has living-wage jobs for many different people with many different levels of education and many different skill sets. We don't have that, and the important question is why. If I were looking to start out now, I quite possibly would look at skilled trades instead of the areas I went into: less debt, more stability and ability to improve my lot in life as a plumber than as a college graduate.